Teniel Campbell celebrates her win in the women's road race at the 2017 Elite Women Caribbean Road Cycling Championships in Martinique. 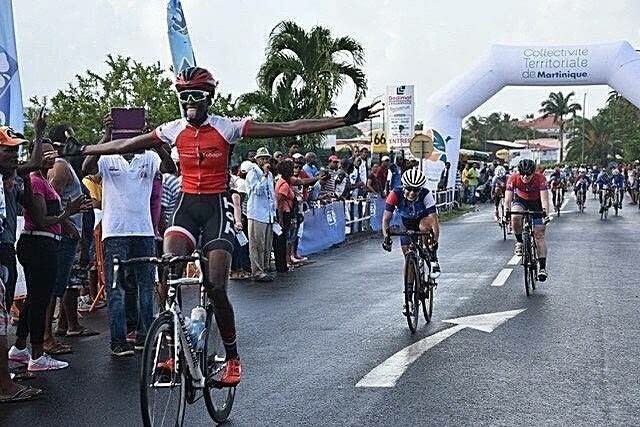 Teniel Campbell won two gold medals at the 2017 Elite Women’s Caribbean Road Cycling Championships in Martinique, over the weekend. Campbell, a former top junior cyclist, is making the transition to elite cycling look easy as she won both the individual time trial and the women’s road race. In the women’s road race, Solymar Reveira of Puerto Rico was second and Bermuda’s Nicole Mitchell finished with the bronze medal. After winning the women’s road race, Campbell said she won the race due to her mental strength rather than her physical ability. Campbell, who represents Team PSL, has been in top form of late as she won the ladies event at the Beacon Cycling on the Avenue in Trinidad earlier this month. The Trinidad and Tobago Cycling Federation congratulated Campbell on her accomplishment. Reply to "Campbell cops two gold medals at Elite Champs"